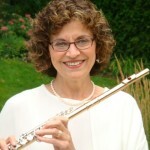 One of Canada’s foremost flutists, Suzanne Shulman has earned international critical acclaim for solo recitals in renowned venues such as New York’s Carnegie Hall, London’s Wigmore Hall and the Chopin Institute in Warsaw. She is a graduate of the Faculty of Music, University of Toronto where she studied with Robert Aitken. As a three-time Canada Council grant recipient she also trained in Europe with Christian Lardé, Michel Debost, Marcel Moyse and Jean-Pierre Rampal. Ms. Shulman has appeared as soloist with major Canadian and international orchestras and is a frequent guest at music festivals at home and abroad. She has performed with the Orford, St. Lawrence and Penderecki string quartets, and also with the late Glenn Gould with whom she collaborated on a variety of recording projects available on the Sony Classical label. With more than 30 recordings in her discography Suzanne can be heard on the CBC, Folkways, Crystal, Golden Crest, Centrediscs, Opening Day and Marquis labels. She is the flute soloist on all the award-winning Classical Kids recordings. As a founding member of the outstanding ensembles Camerata Canada, Trio Lyra and ChamberWORKS Suzanne Shulman has premiered commissioned works by many prominent Canadian composers including Harry Freedman, Srul Irving Glick, Andrew MacDonald, Milton Barnes, Marjan Mozetich, Glenn Buhr, Christos Hatzis and Jacques Hétu. She currently performs with pianist Valerie Tryon, harpist Erica Goodman and the Festival of the Sound ensemble. Suzanne Shulman’s extensive teaching career has included the Royal Conservatory of Music and the Faculty of Music, University of Toronto. She now accepts a limited number of students in Hamilton at McMaster University, at her home studio as well as by invitation to teach master classes abroad.